Do you wish you were more comfortable around other women? Do you avoid female only gatherings or even protect yourself from too much time or exposure to your own mom, sister or friends? Do you wonder if you have what it takes to be a the mom of a daughter? Women at War is all about confronting those lies, overcoming those wounds and learning how to value and develop healthy female relationships. In it, I reveal the schemes that keep women despising their gender and rejecting their strength. Then I share practical tips and tools to overcome our long-term patterns of behavior in order to fully embrace our own gender and begin to develop more healthy, life-giving female relationships. I spent many years figuring out how to like myself more and to get along with other women. When I was diagnosed with breast cancer, my journey to wholeness and healing took on a whole new level of understanding of how to war against the right enemy and to fight for all the benefits and strengths of my femininity. Today, I’m on a mission to demolish the cultural viewpoints of negativity toward women and changing the way we look at, value and approach one another. I’m inviting you to join me. I want to help you connect rather than protect; to unify rather than divide and to honor rather than despise. Visit jangreenwood.com to read a free chapter, order a copy or an e-book, and share this resource with your friends. 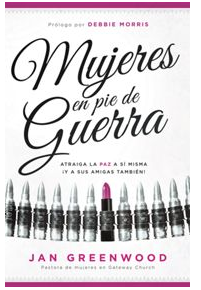 Women at War is also available in Spanish under the title of Mujeres en pie de Guerra.